Installing your theme is pretty easy! After downloading you should have a Himalayas-pro.zip file. This is a compressed file containing all of the required templates and images required for the theme to function properly. By default, the primary menu will fallback to Pages. That means just after activation of the theme, you will see all the pages as menus. Create a custom Menu and assign a menu location to display your own Menu. If you want selective menus with combination of links, pages, categories then custom menu is what you should be looking for. Now choose the Custom links, enter the URL and Link Text. Enter you URL in this formate: http://demo.themegrill.com/himalayas/#about (http://your home page link/Section ID used in widgets). Now, press Add Menu. Check Primary Menu to display it at the header. Section ID: In each widget it contain “Section ID field” (except Call to Action widget), enter the ID (like “about”) and use same ID in Custom Links in a way mentioned above. Primary MenuDisplay the menu beside logo/header text. The recommended size for the slider image is 1600 x 780 pixels. For better functioning of slider use equal size images for each slide. 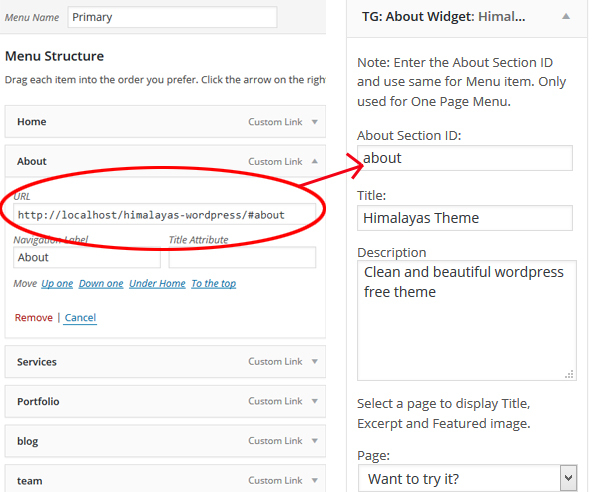 All the options related to Header part are available in Appearance-> Customize-> Himalayas Header Options. By default the Header is sticky. Check the Box to make it non-sticky. Header is Transparent in the front page only, when Slider is activated. Check the Box to make it non-Transparent. 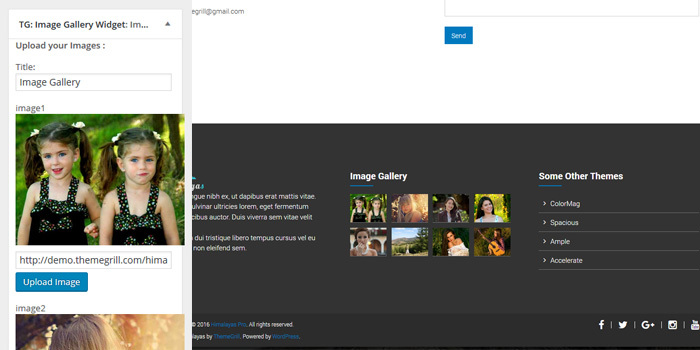 Front Page Template is design to display the widgets used in the Front Page Template Sidebar( Appearance-> widgets). You can use a page (which is assigned to Front Page Template) to display widgets on the Front Page. Create 2 pages ie, Home and Blog Page. Assign Home to Himalayas Startpage Template. 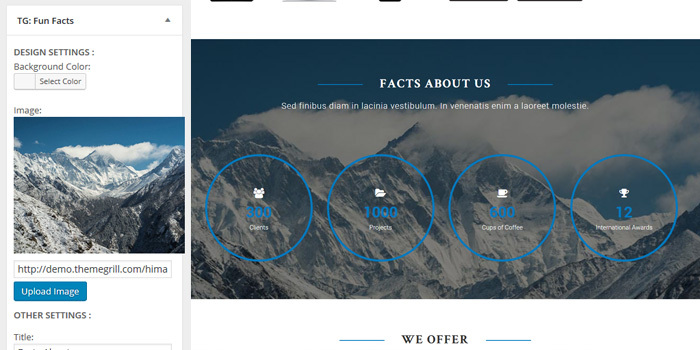 Himalayas provide seven awesome widgets that you can use in Front Page Template Sidebar to make your site look amazingly Beautiful. Go to Appearance-> widgets, drag/select the widgets in the Front Page Template Sidebar to display it on the Front Page Template Page. Note: Enter the unique ID (link about or services) in “Section ID” field in the widgets and use same ID in the Menu for One Page Menu. Create pages for each Services, enter the Title, Description, set a Featured Image and select the Service Template. Enter font awesome icon class to override image in service widget. Info: The Recommended size for featured image is 380 by 240. 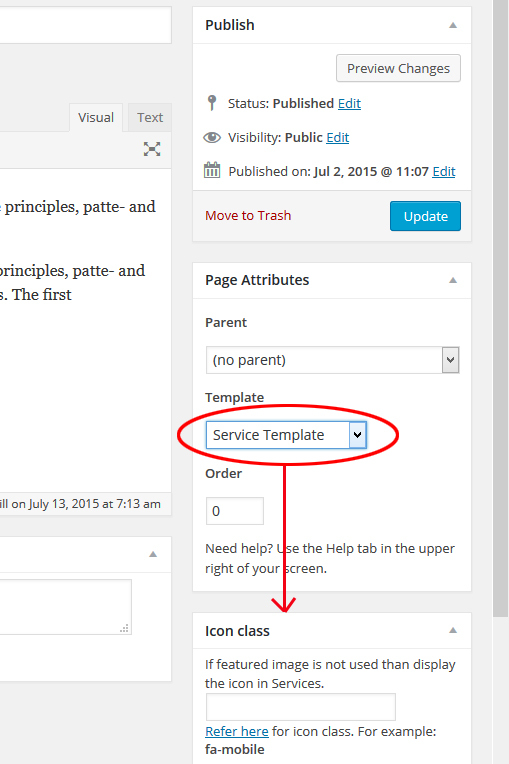 Icon Class Box will only appear if the page is assigned to Service Template. If both, Featured image and Icon Class is used than Featured Image will display. 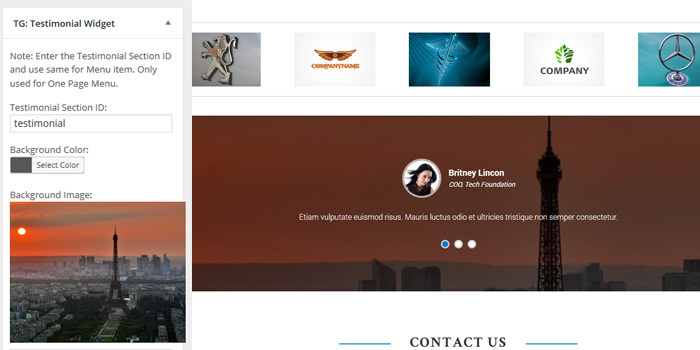 Create pages for each Team member, enter the Title, Description, set a Featured Image and select the Our Team Template. Enter designation to show on team widget. Info: The Recommended size for featured image is 375 by 450. 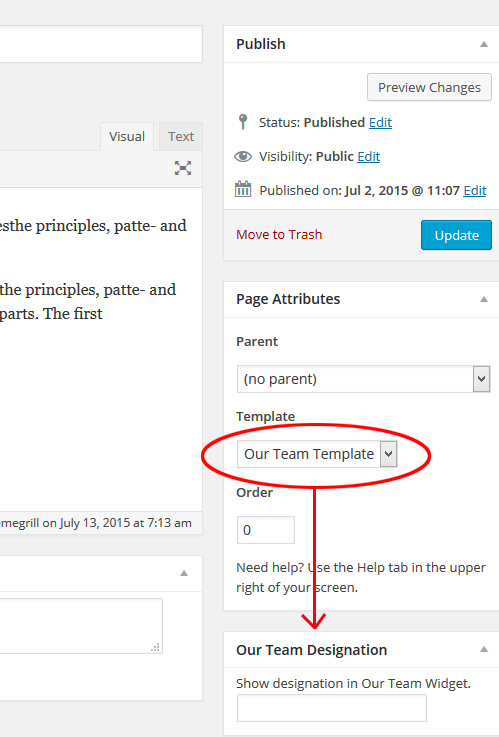 Designation Box will only appear if the page is assigned to Our Team Template. Create pages for each Team member, enter the Title, Description, set a Featured Image and select the Portfolio Template. Enter designation to show on team widget. Placeholder image will only appear if the page is assigned to Portfolio Template. 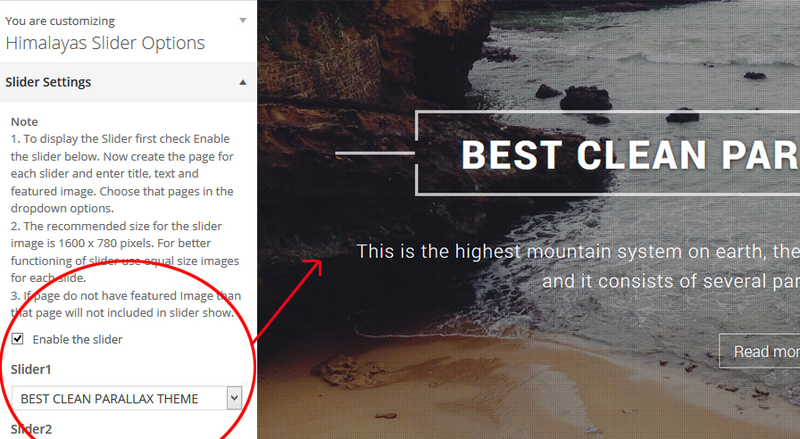 Create a page, enter the Title, Content, set a Featured Image. Info: The Recommended size for featured image is 240 by 240. Drag the TG: About Widget in the Front Page Sidebar and enter the Title, description and select the page to display. There are two button on this widget. First one leads to corresponding page while second one can be defined by user. Enter Button Text, Button Redirect Link and Font Awesome class for second button. This widget is for displaying your contact information and contact form. Enter the Title, Latitude and Longitude for Google Map cordinates. 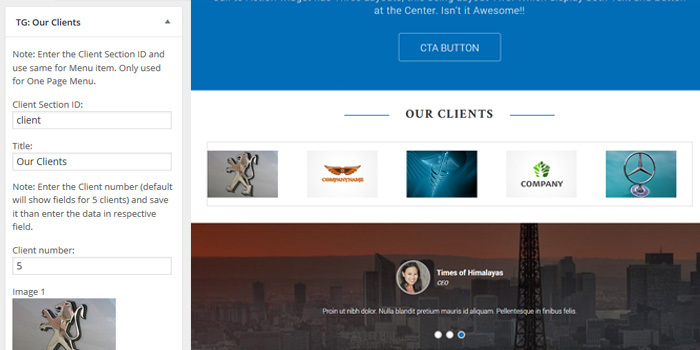 Our theme Supports Contact Form 7, it’s free theme available in WordPress repo. Paste the Shortcode of Contact Form 7 in the Shortcode field. This widget allow you to display fun title , description, icon and total number of fun count. To activate Fun Facts Widget , drag and drop this widget in Front Page Sidebar Widget Area and fill all neccessary details. This widget allow you to display your all images in single gallery. To activate Image Gallery Widget , drag and drop this widget in Footer Sidebar Widget Area and fill the title and uploade the images. This widget is use to display thoughts of your satisfied customer . To achieve this widget enter the number of pages to display.Steps:. Create pages for each Testimonial, enter the Title, Description, set a Featured Image and select the Testimonial Template. Enter designation to show on Testimonial widget. Info: The Recommended size for featured image is 150 by 150. Drag the TG: Testimonial Widget in the Front Page Sidebar and enter the number of page to display. Placeholder image will only appear if the page is assigned to Testimonial Template. Our Client Widget is basically use to display your bussiness partner logo as in horizontal slide show with two beautiful buttons control. Drag the TG: Our Client Widget in the Front Page Sidebar Area and enter the Title, upload client logo with recetion link and hover text. Drag the TG: Our Clients Widget in the Front Page Sidebar and uploade the client logo to display. Info: The Recommended size for client logo is 170 by 113..
To limit the clients number enter the client number, save it and refresh your browser. Himalayas have Custom CSS Box which will ease your work if you need to add CSS in your site. Note: It will strip all the tags. Also, we strongly recommend not to edit the code in the theme’s file. All you changes will be lost if you update the theme. Use child theme instead. All the blog post are displayed in home by default. If widget are placed in Front Page Sidebar than Posts will appear below the widgets. If Static page is selected in Setting-> Reading than page content will display instead of posts. Check the Box to hide the Blog post/page. Excerpt or Full Post Options. Some use wants to display the excerpt of page/post while other wants Full Content of the post on their archive pages. So, we have included this feature in our theme. Just select the appropriate option.